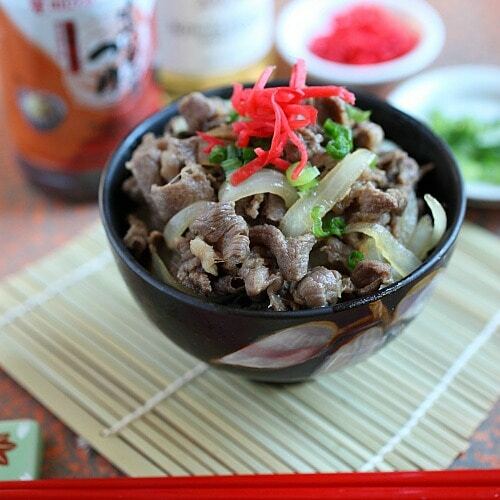 Gyudon (Japanese Beef Bowl) - Gyudon is an easy & delicious Japanese simmered beef with onion, soy sauce. Serve with rice, and you have a great meal for the whole family, and it takes just 15 minutes to make! 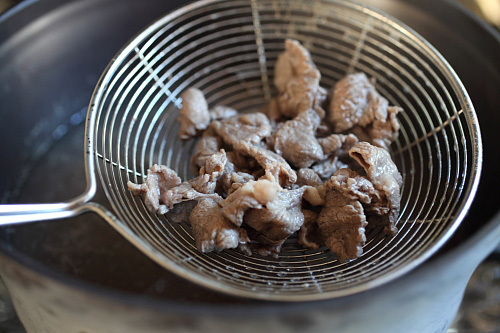 Turn off the heat and add the beef into the water, and immediately scoop them out with a strainer and set aside. DO NOT overcook the beef. Discard the water. Mix all the ingredients in the sauce in a small bowl. Heat a skillet on medium-high heat and add the oil. Add the onions and grated ginger and saute until the onion becomes soft. Add the beef and the Sauce into the skillet, stir to combine well. Stir the beef and onion a few times and turn off the heat. 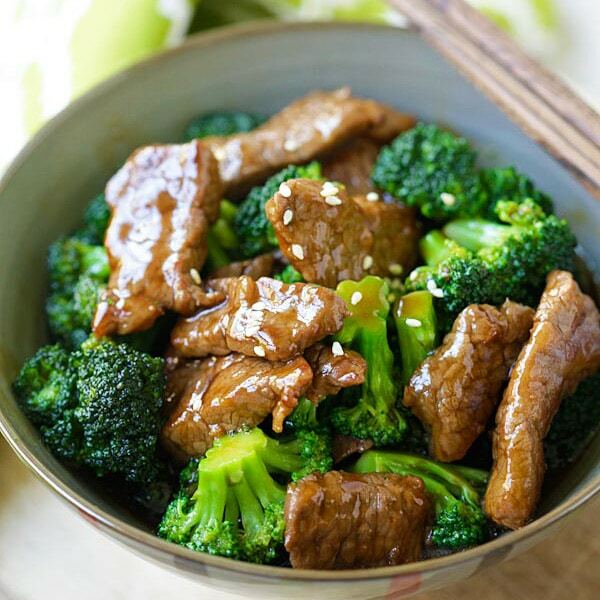 Fill the rice bowls with steamed rice and top the simmered beef on top of the rice. Garnish with some chopped scallion and beni shoga. 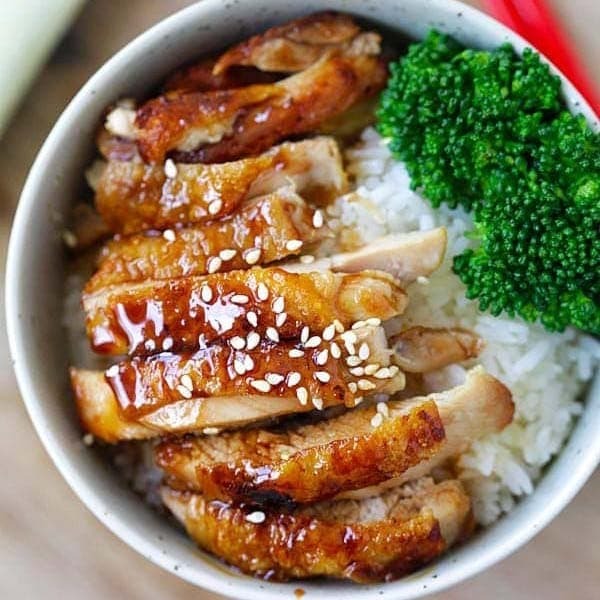 When I was a poor college student, one of my favorite places to eat is Yoshinoya, the Japanese fast-food chain specializing in rice bowls, or donburi. If you have tried Yoshinoya, you will know that gyudon, or simmered beef with onion served on top of a bowl of warm steamed rice is their signature dish. As a starving student, gyudon was my perfect meal and I enjoyed eating it. The gyudon beef bowl has pretty much launched the Yoshinoya restaurant empire, now with over 1,400 locations in Japan and the world! Gyudon (牛丼) is a popular dish in Japan. Packed in bento boxes, disposable styrofoam bowl or plastic boxes, gyudon can be can be found pretty much anywhere in Japan: train stations, food section at supermarkets, or local convenient stores such as 7-Eleven. It’s also a homey dish that many Japanese home cooks prepare at home. The reason is simple: gyudon is delicious and makes a filling meal. The cooking method of gyudon is very similar to sukiyaki donburi, a recipe that I have shared a couple of months ago. With gyudon, it’s actually easier, with easy-to-find everyday ingredients, but the taste is equally tantalizing. When I first started learning about Japanese cooking, my Japanese friend told me that there are four key ingredients in Japanese cuisine: soy sauce, mirin, sake, and dashi (bonito and kelp stock). She also told me to get a good dashi-based soy sauce or soup base. She said that once I have mastered the harmony of these four key ingredients, I would have mastered basic Japanese recipes. Nowsdays, I never run out of my Mizkan Honteri Mirin and Mizkan (Bonito Flavored) Soup Base. I find gyudon especially hearty and satisfying during the cold fall/winter months. Make a big batch of steamed rice and the simmered beef. When you are ready for dinner, scoop a generous portion of the beef on top of the rice and let the simmered sauce absorbed into the rice. Everyone has a Japanese beef bowl in their hands as they eagerly shovel the beef, onion and rice into their mouth. For the adventurous eater, crack a raw egg on top of the gyudon. If you have leftover, pack your gyudon into a bento for your loved ones the next morning. Gyudon makes a happy meal in my family. 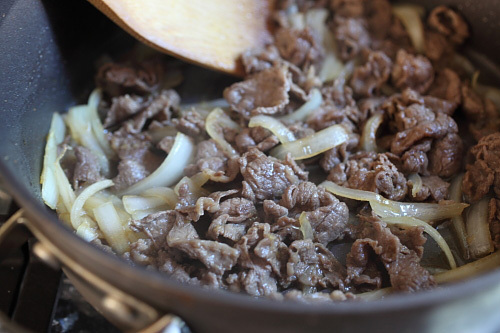 Try my gyudon recipe and I hope your family will enjoy it, too. Bring a pot of water to boil. Turn off the heat and add the beef into the water, and immediately scoop them out with a strainer and set aside. DO NOT overcook the beef. Discard the water. Mix all the ingredients in the sauce in a small bowl. Stir to combine well. Heat a skillet on medium-high heat and add the oil. Add the onions and grated ginger and saute until the onion becomes soft. Add the beef and the Sauce into the skillet, stir to combine well. Stir the beef and onion a few times and turn off the heat. Fill the rice bowls with steamed rice and top the simmered beef on top of the rice. Garnish with some chopped scallion and beni shoga. Serve immediately. By scalding the beef with hot boiling water, the beef is clean with no white foamy bits. You will notice that the water will turn brownish with residue in the water. If you can’t find thinly sliced beef, buy the ribeye, freeze it and slice with very sharp knife. The key is to slice the beef really thin. Mmmm my mouth just watered looking at this. Brings back fond memories of living in Japan! Looks good, simple and easy. Yoshinoya is a few blocks from my house in LA. I’ll give it a try. LOVE Gyudon! Didn’t realize that’s what it was called when I was having the beef bowl at Yoshinoya all these years. Hi Jennifer, now you know this is called Kyudon. It looks so good. Nothing more comforting than beef stirfry over steaming rice. You reckon if I just sear strips of the beef, would it be as good? You can try it out but it won’t be that tender. Gyudon ahhhh it’s making me miss Japan! Lived there for years and I also love tondon….with kimchi! Heavenly! Bee, by sake do u mean any brand of sake that people drink or is there sake for cooking purpose? Thanks before ;) i love yoshinoya can’t wait to try this recipe myself! I use to live in L.A.and go to a little place on holywood blvd and eat at a place called the beefbowl and would order a bowl called beef bowl please tell me how it’s made I love it but don’t know how its made. I know, did we all eat at Yoshinoya at some point of our lives? Hi Bee, I just wanted to say that I admire your work and love your blog. Been coming here for a while now but didn’t stop to write to you. This beef dish is one of my favourites and thought the best place for my first comment! 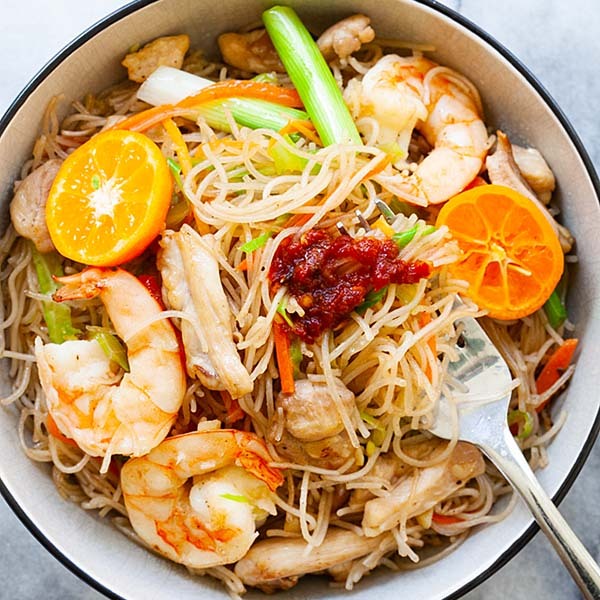 I am an accomplished cook myself and have always been interested in South East Asian food and have learned a lot from your website. Thank you! 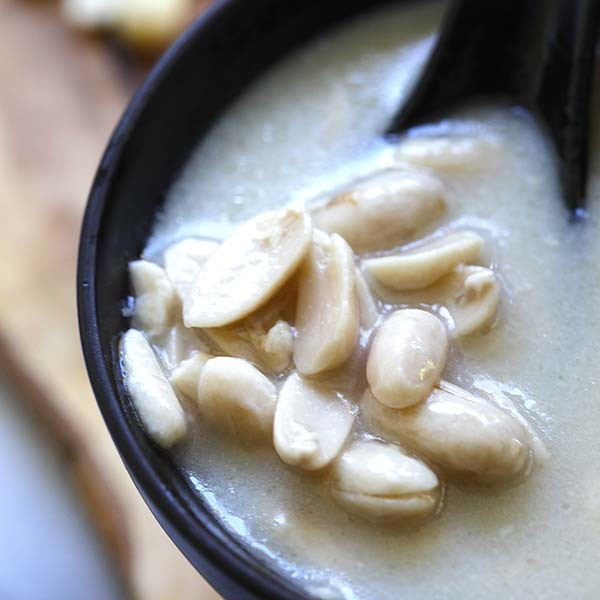 Hi, can i use dashi powder instead of the bonito soup base? Hi, I just tried out the recipe with mixed results. Beef was pretty good, but the sauce/flavour was very weak. The sake/mirin to soysauce/sugar ratio seems to be a bit off. In most japanese recipes I found, and also in other recipes from you the ratio is the opposite. I will try double the sauce amount next time and precook it in order to thicken it up a bit. That all being said, great recipe, thank you very much. If you are in Japan, try out Chikara Meshi gyudon, it is far from being the traditional one, but very tasty. is there any other way of making the sauce using halal ingredients?